Equities opened and a torrid rally fueled by Greenspan’s comments on “not seeing any asset bubbles” drove some shares and indexes to all time new highs. Volume was modest, though, but early breadth was impressive. An afternoon retest led to a case where the Naz made new highs but this was not confirmed by the rest of the indexes. Perhaps a case of no buyers left at the time? The market piked up steam in the last hour selloff, leaving a bit of a bull trap and candlestick tail. Non confirmations indicate a trading range environment. The SPs, NAz and DOW may drop back into their prior trading range (see chart below of possible “turtle Soup sell) The russell will be the one to watch still as it has been the trendiest. It cam just shy of an all time new highs yesterday, and it may still eventually take this level out. There is a pinball sell on the Canadian Dollar. It has retraced back to the area of its daily 5 SMA> There was too much downside momentum in the NAt Gas to be aggressive in terms of looking for the pinball buy. A consolidation day after range expansion is more likely. The Yen has reached a perfect equilibrium point and is coiled. This does not guarantee a breakout of any significance, though as this market is prone to long “dead” periods. The monthly charts still have a Buy Divergence while the weeklies may do a partial retest down. This can lead to continued stalemate. Gold and Silver – currently there is a Power Buy on the intraday charts. The dailies made new momentum highs so continue to watch for intraday continuation patterns. 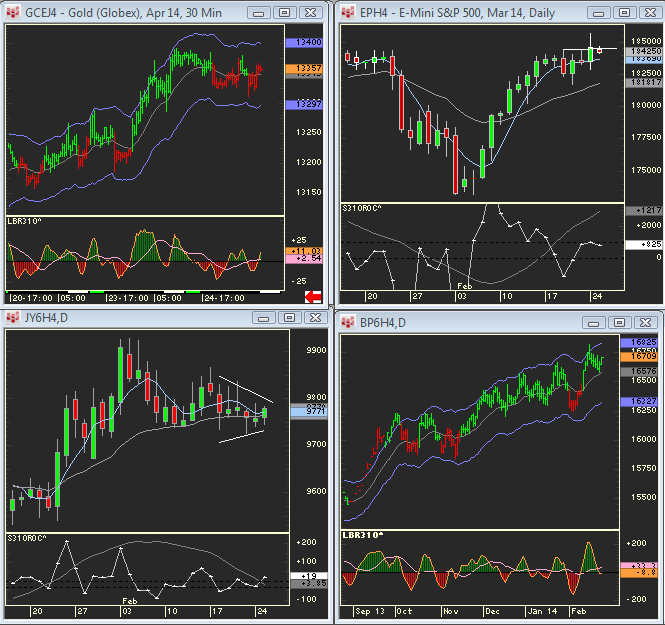 They are consolidating after a big move up and three days lo to high but downside is probably limited.